The first genuine collective bargaining agreement between farm workers and growers in the history of the continental United States, beginning with the union contract signed with Schenley vineyards in 1966. The first union contracts requiring rest periods, toilets in the fields, clean drinking water, hand washing facilities, protective clothing against pesticide exposure, banning pesticide straying while workers are in the fields, outlawing DDT and other dangerous pesticides, lengthening pesticide re-entry periods beyond state and federal standards, and requiring the testing of farm workers on a regular basis to monitor for pesticide exposure. The first union contracts eliminating farm labor contractors and guaranteeing farm workers seniority rights and job security. 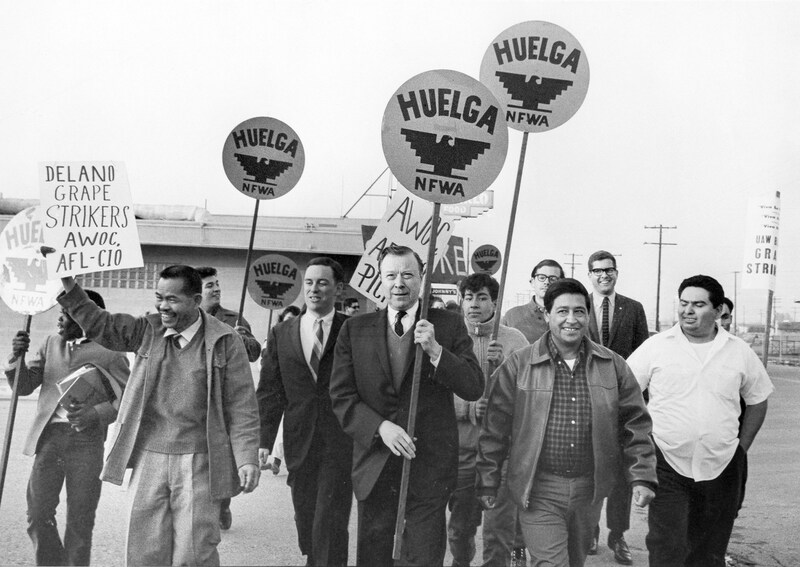 Establishing the first comprehensive union health benefits for farm workers and their families through the UFW’s Robert F. Kennedy Medical Plan. The first and only functioning pension plan for retired farm workers, the Juan de la Cruz Pension Plan. The first functioning credit union for farm workers. The first union contracts regulating safety and sanitary conditions in farm labor camps, banning discrimination in employment and sexual harassment of women workers. The first union contracts providing for profit sharing and parental leave. Abolishing the infamous short¡©handled hoe that crippled generations of farm workers and extending to farm workers state coverage under unemployment, disability and workers’ compensation, as well as amnesty rights for immigrants and public assistance for farm workers.